In the first mission of the upcoming computer game that Chris Hazard, PhD, has been trying to make since 1999, our hero, a man named Holloway meets himself. In the second mission, Holloway's foot soldiers are killed in an ambush. But time can be backed up. The men can be given new orders in the past. They march a different way. They survive. In the third mission we, the controllers of Holloway's fate, can look into the future and see his allies die. Changes in Holloway's present can prevent that. And in the fourth mission Holloway travels minutes into the past to do something important, only to have his enemies respond by attacking him in the near-future. All of these time jumps and time revisions—all of the movements of Holloway and his army of soldiers—are under the control of you, the player. You play the present, the past in the future. You issues orders in any minute of a timeline, forward or back. If your head isn't hurting and your appetite has been whet, you're ready for the game Chris Hazard, doctor of computer science, dreamed up. And, very soon, his game will finally be ready for you. "I thought: 'What if you had time travel?'" That conversation happened in 1999. 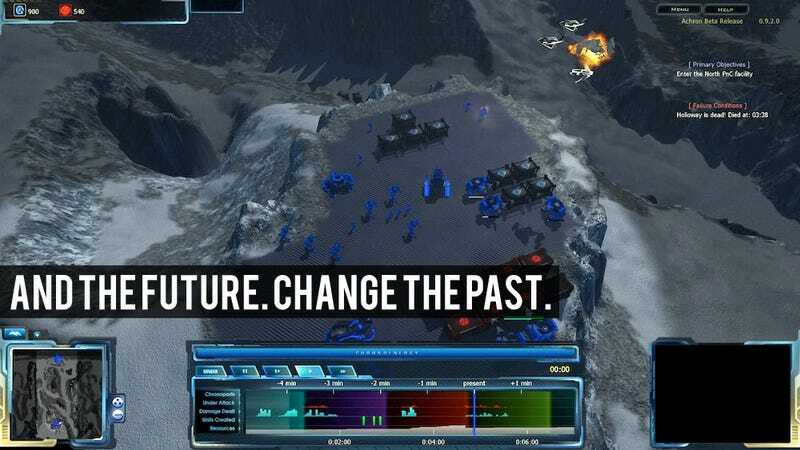 It was the birth of Achron, the real-time strategy game that is finally on the verge of release. Hazard started planning Achron then and started coding it in earnest in 2001. Around that time he concluded that home computers wouldn't be powerful enough to do what he wanted his game to do, not until 2006 or 2007. By 2009, with development finally happening in earnest, Hazard and the growing team of developers behind Achron were far enough along to show the game at the Game Developers' Conference's Experimental Gameplay Workshop. In 2010 they started offering a few levels of the game in exchange for pre-orders. A multiplayer community swelled, exploring all the possible exploits and tricks in a real-time strategy game that lets you defeat an enemy, if you so choose, by going into the past and snuffing him out when he was weak. Last month, Hazardous Software sent me a preview build of the game's campaign, making me one of the first non-testers to try it out. Later this summer, the game will finally be released. I am not much of a computer gamer nor much of an RTS gamer. But I do love wild ideas. Achron is a wild idea. It's not simply an RTS but a game in which you can clearly see your actions of the past and present as well as their consequences in the future, during any moment when you're playing the game. It's a game that lets you jump ahead to the future to see how bad it gets or jump back to the past and start tweaking things to see just how much better things can go. You can judge Achron's graphics, which I'll just say are fine. You can judge the pathfinding of its little troops, which I'll just say is troubled enough to leave some walking into walls instead of around them. Such things can improve and will as much as a game that has to devote processing power to action spread across a malleable timeline can permit, Hazard told me. What doesn't need much improving is Achron's core idea. And I'll judge that for you: it's great. In the first campaign mission, things are simply and there isn't much time travel. The player controls Holloway, a human commander who marches through a battlefield in order to figure out the agenda of some alien invaders. The mission is basic and is used to teach rudimentary RTS unit selection and navigation control. Near the end of the mission, Holloway encounters his time-traveling self, a second Holloway who the player can also control. Plus there's a scientist, a time travel device and the hint of what's to come. In the second mission, the game's radical revision to how a game can be played is revealed. The core idea is, as described above, that the player can access and manipulate events in various parts of a timeline. The timeline is represented on-screen, as you'll see in all of the screenshots for this story. It gently scrolls to the left, as the present becomes the past. You can click on any moment in the timeline and you'll be whisked to that moment of the game mission's conflict. You can click on two minutes ago and see what you were doing then. You can click on a minute from now and see what your orders will cause. In the screenshots in this story you'll see that the timeline is speckled with small vertical bars of light blue and red. They represent damage dealt and damage received, respectively, by your units in each of Achron's missions. They appear as the game calculates that such damage will occur. In the second mission, for example, you give a few soldiers the orders to run east down a road. The road will be intersected by an enemy. Sure enough, as you issue that order, in the future part of the timeline, a few red and blue spikes pop up. They represent that coming intersection and the battle that will ensue. In other words, you can see your problems and the successes on that timeline before they happen. In the case of the second mission, you see future ambushes, and you are taught that the best way to deal with them is to travel back in time, revise your orders and not get your soldiers killed. The second mission also teaches you that you can play in the past. Doing so drains a meter that shows "chrono-energy," which therefore discourage you from repeatedly going to the past to re-do bad moves. There are ways to slow that drain of energy in the past by playing the past in fast-forward or with units efficiently assigned to move in unison. As I learned, the second mission teaches that you may effectively travel seconds or minutes into the past to correct mistakes, but you will have to be precise in the ways you revise the past lest you run out of energy to change those older events. The oldest parts of the past will eventually even become immutable. That threat encourages you to play in fast-forward to catch up to the present where revising strategies is less costly. Ideally, you'll keep your eye on the future and avoid having to travel too much to the past to correct mistakes. The second mission involves the discovery that humanity's enemies have their own squabbles. The mission changes and you're forced to transport captured enemies back to base. This part of the mission vexed me as I wound up stuck in a stressful section of the past, revising orders to avoid attacks and running low on chrono-energy. I discovered a devious twist: traveling into the past to issue a new order doesn't erase the orders given later in a timeline. A tank that is told to move south, for example, will still try to move south even if you go into the past and tell it to first move north. Got that? There's an out-clause to this too: the game allows you to erase any "future" orders, but that costs energy. Hazard has a wonderful metaphor for his game, one he uses to explain why he has trouble going back to games that don't have an Achron-style timeline. "It's like going from a word processor to a typewriter," he told me. "You want to be able to undo and revise the document." In Achron, you can bookmark multiple moments in the timeline—in the past, present and future. You can jump to any of them and use your units there. You can undo their moves and issue new ones. Until the past becomes the immutable past, you can keep revising, keep poking at the events of this history you've made and change them. This is essential to succeeding in Achron, even as early as in the game's fourth mission. In mission four, Holloway has a problem. There is a bomb to the west and he must go into the past to stop it from exploding. In the present, he has access to a chronal transporter that can zap him back to any moment in the timeline that the player clicks on. He also has access to a teleporter that will zap him to any place on the map the player clicks on. Both the time and space transporters can only move units that are within a set range, so Holloway has to be near them before jumping. The player must send Holloway and a few tanks to the past, but the player is also warned to keep a few units in the present. Sure enough, as Holloway goes into the past to teleport into the enemy stronghold and destroy three bombs, alien enemies attack the chronal transporter close to the present. In the present, which is becoming the future, enemies attack. But before they do, something odd happens. While Holloway is working on the bombs he catches up to the part of the timeline right before he jumped back in time. Briefly, the game warns, there are two Holloways, both available for the player to control. The limitation is that the pre-time-jump Holloway shouldn't be moved far away from the chronal transporter If he is moved away, it will never send him to the past. He'll never destroy the bombs. It'll be a disaster. In Achron's multiplayer—and, yes, all of these tactics and more can be used in multiplayer—players use this kind of time travel to double their units. That's one of the reasons Hazard's team implemented the wave that forges the immutable past, to limit this kind of tactic. In this early campaign mission, however, it's a mere novelty, not an exploit, that two Holloway's co-exist, both products of the player's orders both available for further control and revision of command. The fourth mission was hard. Rather, I think I made the fourth mission hard, because, for a while, I hadn't re-thought the way I think of time. I'd send Holloway back in time to work on the bombs. Then I'd get an alert about the attack happening close to the present on the chronal transporter. I'd jump to that moment, leaving bomb-destroying Holloway to the orders I'd queued for him, and I'd focus on the attack in the... future, which I thought of as the present. With my eyes off of Holloway, he kept dying. I'd fend off the attack on the chronal transporter, but to what end? Holloway kept failing to stop those bombs in the past. Finally, I realized, I didn't need to worry so much about the attack on the chronal machine. I could let my forces die trying to defend it. I could let it be destroyed. Why? Because I could fix that later. My priority was in the past with Holloway. I could allow future tragedy to occur because I could always undo future tragedy. I wasn't playing a typewriter. Hazard was right. Things weren't linear and revision was possible. I was playing a word-processor. I've only made it four missions into the game, but I look forward to playing more. Hazard is right that what Achron does changes the way one looks at one's actions in a video game. It's empowering to see the past, present and future all at once and to know they all can be changed. It's exciting to re-shape a timeline. And it's terrifying to think how brutally skilled multiplayer Achron gamers would use such abilities to wipe out players like me before—literally before—we even know what's happening. Achron (official site here) runs on Windows, Mac and Linux. Hazard and the team of six regular employees of Hazardous Software believe their Windows and Linux versions are furthers along but are optimistic that all will be ready for sale late summer. Hazard recommends that Windows users have a "decent" dual core system with an ATI or Nvidia card from the last three years. Achron may not catch your eye in screenshots, but make sure you've got something to play this. This game revises how we can play a video game and has got me wondering about what we should be able to do about the decisions we make in games. Achron is an advance. It's an idea that was well worth incubating since 1999.